Pho from a recipe in Simply Vietnamese Cooking . 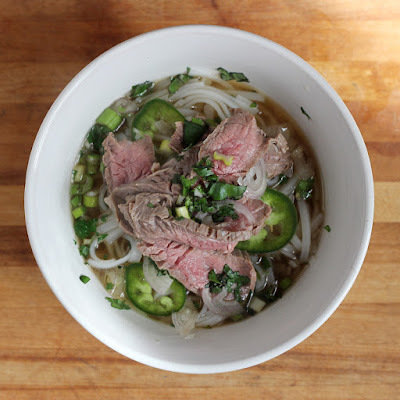 When I requested Simply Vietnamese Cooking by Nancie McDermott to review, I had exactly one thing in mind: pho. I'm by no means an expert in pho - I've only had it a few times in restaurants - but I loved it every single time. So of course, I wanted to know how to make it. I'll admit right here that I didn't follow the recipe precisely. I had a beef broth made already, and didn't see a reason to make a similar one for the pho. So, I adjusted it with the flavors that it required, like cinnamon, cloves, star anise, and ginger. Then I followed the rest of the recipe. It was pretty danged good. I couldn't stop eating it. I slurped down that soup so fast, it was crazy. And then I had it again for the next meal. Until it was gone. Next time I might make the recipe 100 percent as written, but I might have to double it so I have enough to last. I've browsed through the rest of the book, and there are plenty of other recipes that look just as good. Loaded with flavor. While some of the recipes require ingredients that might require some searching, most of the recipes don't need anything harder to find than fish sauce. And that's a huge plus. I have a pretty well-stocked kitchen and pantry, and I don't mind hunting down an odd spice or a weird noodle. But if recipes require strange varieties of fresh fish or vegetables ... well, those are a lot harder to source. I don't mind reading cookbooks like that, but when it comes to cooking, I prefer a book that has recipes I can make with a simple trip to a local grocery store. And then if those work, I'm fine with ordering the more exotic ingredients. Overall, I like this book. It's not the prettiest one in my collection, but it's one I'll cook from again. 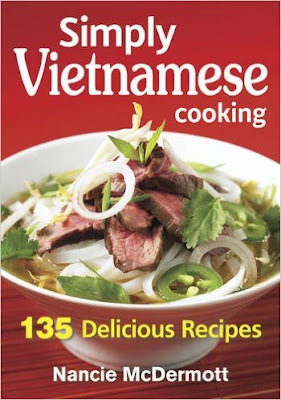 I received Simply Vietnamese Cooking from the publisher for the purpose of a review. Looks so delicious! I'm so starving now.